Belgian metallers KILLER will release their new album, Monsters Of Rock on May 21 via Mausoleum Records. The cover artwork and a stream of the title song "Monsters Of Rock" can be viewed below. KILLER are celebrating 35 years of “We-take-no-prisoners” hard rocking heavy metal! 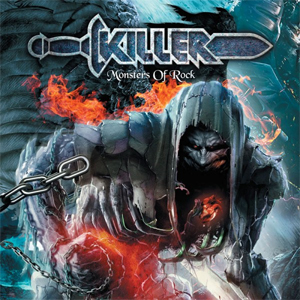 KILLER returns with Monsters Of Rock, their seventh album. Produced by Shorty and drummer Vanne, the album packs a powerful wallop, carrying on in the classic tradition of Ready For Hell, Wall Of Sound and Shock Waves. The spirit of the 1980s power-trio recorded with the technical capabilities of 2015 – Hard rockin’ heavy metal does not get any better! "No Exception To The Rule"
From the outset in 1980 the power trio was embraced by a myriad of loyal fans all over the world. Their first three albums; Ready For Hell, Wall Of Sound and especially Shockwaves, were unanimously lauded by aficionados and critics alike, rubberstamped heavy metal masterpieces of the 80s. By the mid-eighties the band played prestigious festivals, toured the whole of Europe, and sold albums from Tokyo to Rio de Janeiro and from Moscow to New York, and just about everywhere in between. A noteworthy climax being a tour of Poland in 1986, where for the duration they played for captive audiences numbering no less than 10,000 eager fans each night. KILLER’s fourth album, Fatal Attraction, eagerly awaited by fans for over five years, was another success. By 1991 however Grunge music ruled the world and KILLER (by then a quartet) took a step back. Later that year founding member, guitarist/ vocalist Shorty released a solo album entitled Too Wild To Tame under his last name: Van Camp. The album sounded as if it could have been KILLER, volume IV. In May 2002, a reformed KILLER were joined by Doro (WARLOCK), OSTROGOTH and CROSSFIRE, headlining the sold-out Mausoleum Records 20th Anniversary Concert. The overwhelming success lead to the recording of Broken Silence, an album featuring great anthem-like songs, as well as, for the very first time: keyboards. The 2005 follow-up, Immortal, once again more prominently featured Shorty’s trademark guitar sound.